...measures the sentiment of the individual investor by dividing put volume by call volume. At the extremes, this particular measure is a contrarian one; hence, P/C ratios above 1.0 signal overly bearish sentiment from the individual investor. When countries live and spend beyond their means, an unlimited supply of funding eventually drys up. The contagion concern is associated with countries like Spain, Portugal and Italy. In the U.S. Puerto Rico has now become an issue and broadly, the U.S. is living far beyond its means which needs to be addressed sooner versus later. 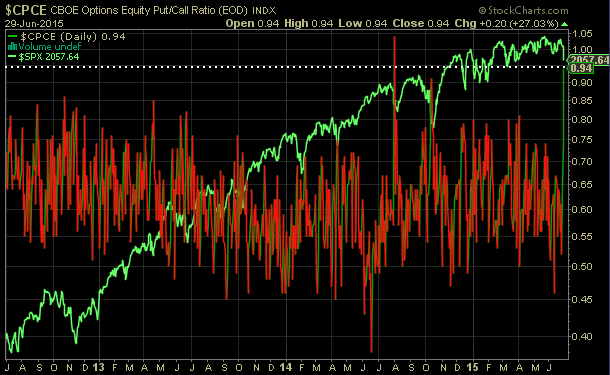 In the near term though, the markets sometimes become disconnected and sentiment does suggest an overly bearish investor when looking at the put/call ratio. 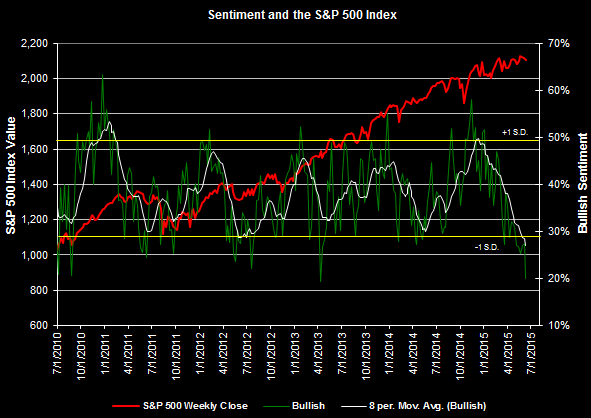 Other individual investor sentiment measures also are bearish (AAII bullish sentiment.) Overly pessimistic sentiment indicators are contrarian indicators and are indicative of potential market bounces. S&P Dow Jones Indices published a report in September 2013, Shocks & Stocks, that analyzed market shocks and the initial market decline and the time necessary to recover the losses. Included in the report is the below table. "Granted, even though selected events took much longer to play out than the medians would suggest, these extreme situations usually occurred within the confines of a long-term bear market and did not precipitate the initial decline. Examples of these include: 1) Pearl Harbor, 2) President Nixon’s resignation, 3) the terrorist attacks on 9/11, and 4) the collapse of Lehman Brothers. So should history repeat itself, and there is no guarantee it will, unanticipated events that occur within bull markets that throw markets for a loop are typically assessed for their economic impact in short order, allowing opportunistic traders to step in and quickly push share prices back to break-even and beyond." A a word of caution for investors wishing to sell stocks early Monday morning, remember, these crisis events generally have a short lived impact on the return in equity indices. 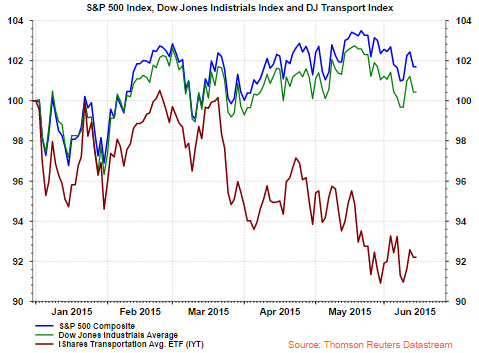 S&P Dow Jones Indices released first quarter 2015 buyback detail for the S&P 500 Index. 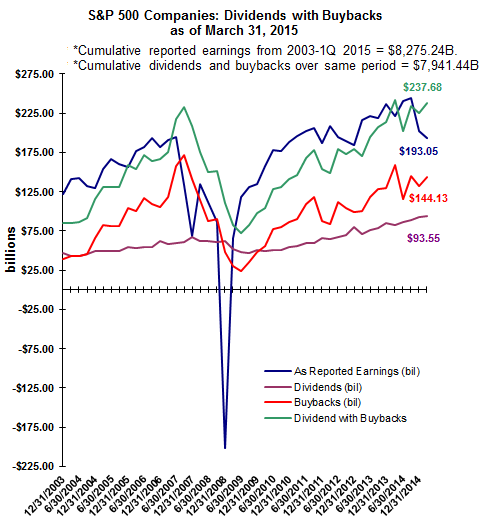 On a year over year basis, buybacks declined 9.5%. In conjunction with the YOY decline in buybacks, YOY operating earnings declined 6.3% and as reported earnings declined nearly 13%. Important in the buyback report is the fact 20% of S&P 500 companies reduced their share count by at least 4%. This share count reduction enhances reported earnings per share and investors need to be aware of the artificial growth in EPS that results from this activity. Better Investing Magazine maintains a list of most active stocks as reported by their members. From time to time I highlight recent activity. 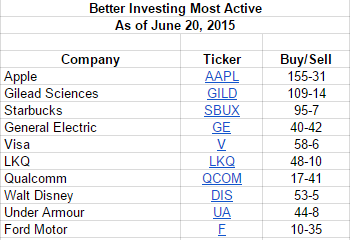 Below is the list of most active stocks as of June 20, 2015. Most of the active stocks on the list are experiencing more buying than selling. Two issues, Qualcomm (QCOM) and Ford (F), are experiencing the most selling pressure as reported by BI's members. The VIX index is a measure of volatility and a higher VIX reading is associated heightened investor fear. Because this index is know as the fear index, a higher VIX reading is viewed as a contrarian indicator. In late 2008 the VIX hit a level of near 90% as compared to today's reading of about 14%. Shortly after this high reading the S&P 500 Index reached a bottom and has been on a march higher since. VIX measures are available for other markets outside the U.S. and one getting some attention at the moment is the EURO STOXX 50 VIX. As the below chart shows the VIX for the EURO STOXX Index has widened to a historically wide level versus the S&P VIX. This widening is likely the result of concern around the consequences of the resolution of the issues in Greece issues and the potential impact on European markets. As can be seen in the above chart, the average spread between the VIX and EURO STOXX VIX is 3.78% and the current spread is 14.95%. The current reading places this spread difference in the 99 percentile over the last ten years. For investors then, the question becomes how this spread differential gets resolved. Is the ultimate resolution in Greece a "kick the can" one which is likely viewed favorably by the market or is the future path one where Greece is removed from the Euro Zone? Can Hui, CFA wrote an insightful article covering potential outcomes for Greece and how investors can take advantage of the results in an article titled, Two ways to Play Greece. One important distinction for readers in the article is the two ways to play the Greece situation depends on whether one is a trader or an investor. Market similarities comparing this year to 2013 are beginning to rise to the forefront of investors' minds. For equity investors, let's hope 2015 is a repeat of 2013. In 2013 the bond market experienced a "taper tantrum" as the Fed was preparing to end its quantitative easing programs. From early May 2013 to mid September the 10 year US Treasury yield rose from 1.7% to 2.9%. On an absolute basis, this is a significant rise in interest rates and caused bonds to selloff.. The iShares 20+ Year Treasury Bond ETF (TLT) fell over 17% from May 2013 to year end 2013. Just two weeks ago I wrote an article focusing on investment risk and market corrections, Incurring Investment Risk Near A Market Correction. The "correction" thinking seems to remain high on many investors' and strategists' minds. From a contrarian perspective, market corrections are difficult to time and corrections rarely occur when everyone expects them to. This article is falling into the same line of correction thinking, maybe a trap of sorts; however, the following thoughts will touch on an equity strategy that historically has held up better in declining equity market environments.